In Zengine a form can be created to collect data for a specific purpose. For instance, you might have a customer form that holds customer data, a project form that holds project data, a leads form that holds lead data, a timesheet entry form that may hold timesheet entries, and so on. In traditional database terms, a form is similar to a table. Each form within a Workspace contains different fields of data. For instance, if you had a form to hold a list of your contacts, the fields may be "first name," "last name," "address," etc. In other words, if you had your data in a spreadsheet list where each contact was on its own row, a field would equate to a column in your spreadsheet. Many times you will only need to use one form in a workspace, but Zengine allows you have one or more forms in a workspace. The forms can be completely distinct from each other but often times you will want to link them together. For example, you may have a list of companies in one form and a list of contacts in another form. Zengine lets you link them so that when you enter a contact you can attach that contact to a company. When you look at the company, you can see a list of all of the linked contacts. Your forms will show up on the Data tab of your Workspace. In the above screenshot, you can see that this workspace contains 7 forms: Submissions, Reviews, Awards, Applicants, and 3 more accessed via the More dropdown. Clicking on the respective tabs will present you the existing data for that particular form. Forms can be created manually through our Form Builder or by utilizing existing data through an Import. These methods and step by step guides are covered in their respective articles. Forms can be utilized for internal use only, where you and other workspace members add and manage data from within your workspace. Alternatively, forms can be set to be external-user facing, meaning that they will be associated with a URL to be shared with others who will complete a form and submit it. This data will automatically populate your spreadsheet, or Data tab, in Zengine. Learn more about Interacting with External Users. In you would like to reorder forms in your workspace or make other changes, go to your Settings tab and click Forms. Use General Form Settings to Rename the form, change the Record Identifier, and add a Form Purpose. 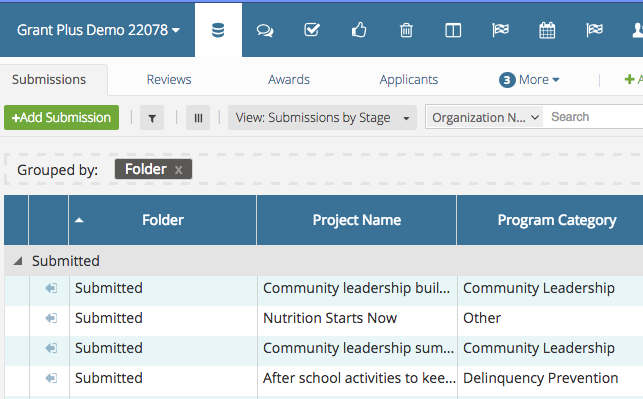 You can view all of your forms on the data tab and can search for a particular form you need by using the dropdown menu search bar. As you add more forms to your workspace, you may wish to group them based on what their purpose is. For example, you may have a set of forms that pertain more to the applicant and capturing their info (versus capturing application info) and so you may want to group those forms into a group called People. The form groupings will be listed in the top left corner of your data page. By selecting the 'People' group from the dropdown, now only the forms selected to be in this group (Contacts, Companies, Email, Profiles) will show. In order to create and maintain Form Groups, go to your workspace's Settings & Tools, and then Forms. Then select Manage Form Groups in the top right corner. Here you will see existing Form Groups which you can edit, as well as click the green '+Add Group' button to add more. To learn more about managing Form Groups, go here.